A pineoblastoma is a rare malignant brain tumor which arises from the cells of the pineal gland which sits near the center of the head and brain. They are a form of primitive or undifferentiated tumor which displays pathology which is very abnormal, quickly growing and invasive. While other types of tumors are more common in the region of the pineal gland, such as a pineal germinoma, a pineoblastoma is one of the more malignant tumors found in this area. These high-grade tumors are related to and on a spectrum with more benign variants which are called pineocytoma, pinealocytoma or pinealoma (all different names for the same benign tumor). Patients who present with symptoms suggestive of a brain tumor such as this will generally undergo a thorough neurological evaluation and examination. Often, a neuroimaging study such as a CT scan or MRI scan will be performed to detect the tumor. An MRI shows the most resolution of the tumor and surrounding normal structures. While most tumors in the region of the pineal gland can be identified readily on MRI, it is not always possible to tell what time of pineal tumor it is based solely on the imaging study. For example, it may be difficult to distinguish a pineoblastoma from a pineocytoma or a pineal germinoma. While some germinomas are treated solely based on the imaging findings, many tumors will require a surgical procedure to obtain tumor tissue which can be analyzed by a pathologist to make a definitive diagnosis. In the case of pineal region tumors, some patients will undergo blood and/or cerebrospinal fluid sampling so that they can be analyzed for two compounds, beta-HCG (human chorionic gonadotropin) and AFP (alpha-feto protein). These compounds can be produced by some types of germ cell tumors. Pineoblastoma however does not produce either. Additionally, the cerebrospinal fluid is sometime analyzed for cytology, meaning that it is analyzed for any tumor cells in the fluid. This can indicate spread of the tumor through the fluid to the spinal or other regions of the central nervous system. Treatment for pineoblastoma varies from patient to patient depending on specifics of each case such as age, tumor size and presenting symptoms. While other pineal tumors such as germinoma are very sensitive to radiation, surgical removal of pineoblastomas is often preferable. The aim of surgery can be to both obtain tumor tissue to analyze to make a definitive diagnosis and to remove as much of the tumor as possible. 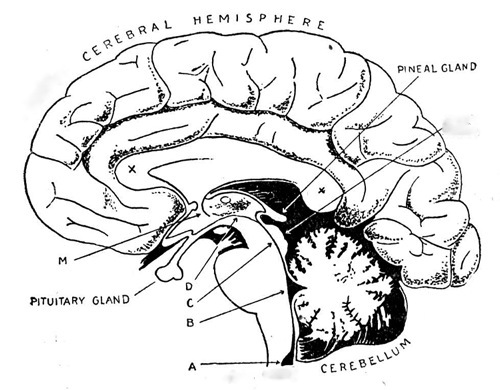 Various approaches to the pineal region can be used by neurosurgeons. In general, the procedures require a craniotomy (opening of the skull) in the posterior part of the head and is directed either above the cerebellum or between the occipital hemispheres to reach the pineal region. Some patients will undergo other treatments such as radiation treatments for residual tumor or chemotherapy, particular in these malignant tumors.